Book an economic private taxi from Malaga airport to Frigiliana with our transfer services filling in the form on the top. Distance from the airport: 71 km. Frigiliana is located in an area called La Axarquia which includes all municipalities in the eastern part of the province of Malaga. The Axarquia includes coastal municipalities such as Rincon de la Victoria, Nerja or Velez-Malaga, among others. But it also comprises inland villages such as Iznate, Competa, Almachar, Torrox, etc. ; beautiful villages which managed to thrive maintaining their essence of Andalusian village, Frigiliana being one of the most outstanding. On leaving the airport and driving in direction to Malaga on Avenida Velazquez you can see very soon a detour to access the highway MA-20; continue until you automatically merge into the AP-7 and from there you travel approximately 55 kilometres to the exit Nerja – Frigiliana. Then after leaving the freeway there is a roundabout, here turn left heading towards Frigiliana. When driving up the road to Frigiliana, you will be amazed by the beautiful mountains around, notably beautifying your coming to the village. Just before reaching the village you can enjoy a spectacular view of your destination situated at higher altitudes. Economy Malaga transfers offers you a professional service by taxi or shuttle bus to Frigiliana. A transfer with our company will give your vacation the comfort you need, sometimes marred by delays and complications because of public transport. Would you rather go on a public bus or a high performance private taxi or minibus? We also have a more affordable standard category. What to do in Frigiliana? The historic old centre of Frigiliana is Moorish and Mudejar; a beautiful area full of tranquillity, completely away from the bustle of big cities. The old town is filled with simple white houses, beautiful streets adorned with plants and pots, courtyards and stepped slopes that everyone can recognize by the famous postcards that sometime might have drawn our attention. 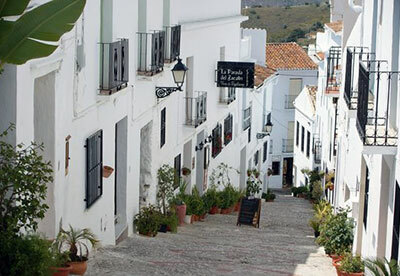 Therefore we highly recommend taking a long walk through the most important area of Frigiliana, the historic centre, know its different streets, shops and enjoy good food with typical dishes of the village. 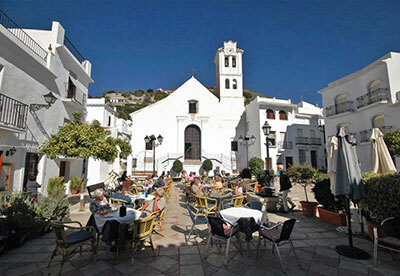 What to see in Frigiliana? Then we’ll tell you the key places you should not miss on your visit to this town of the Axarquia. 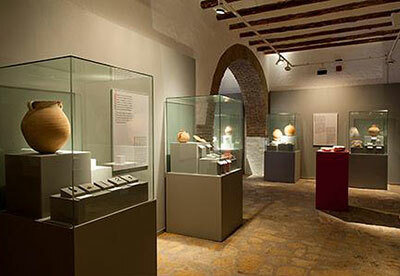 The Archaeological Museum is to promote, publicize and preserve the culture and history of Frigiliana from the Neolithic; located in the historic Casa del Apero, an XVII century building. Here is shown a collection of 125 pieces discovered in the vicinity of the town. The building El Ingenio from the XVI century, today serves as a factory for preparing molasses Nuestra Señora del Carmen. It is recognized as the most historically valuable building of Frigiliana, which is still using machinery from the early twentieth century. If you enjoy watching spaces dedicated to the Christian religion, you can visit the chapel of Ecce Homo. The most important church of the town is the Church of San Antonio Pauda, built in 1676. Other interesting places to visit are the remains of the Moorish castle, the Old Fountain, the historic panel on the Moriscos, the Tower and the iconic building Los Reales Positos. For its vast natural areas and surrounding mountains, Frigiliana becomes a perfect place to breathe fresh air, enjoy hiking trails and mountain hiking. In this town you can enjoy some good Migas (a typical dish of the countryside with bread, garlic, tomato, pepper and onion). Choto (young goat) is considered the typical dish of Frigiliana; another dish is called Arropia (made from molasses).To drink is very common in the wine lists the Muscatel wine, an aromatic and dry vine. As typical sweet, you won´t be able to resist the sweet potatoes with honey (Batatas con miel) or the exquisite San Juan cakes. Some restaurants that we thought worth mentioning are: The restaurant Romantica, the bar El Cetro, Restaurant Al Fuente, Las Chinas, Splash Bistro, La Bodeguilla and El mirador de la Sabina, among others. 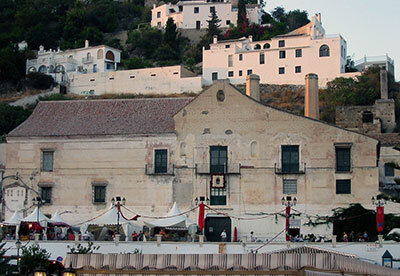 How about a trip to Frigiliana? From this link, you can access useful information about our service of day trips and excursions. The activities are always organized in a personal way. If you want to start hiring your tour or ask any questions, please contact us. offers private taxi services to any destination in Andalucia, where you will find your perfect travel on holidays.